Root adaptations make it possible for mangroves to live in the soft sediments along the shoreline Root adaptations increase stability of mangrove trees in the soft sediments along shorelines. 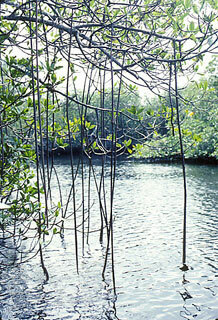 Red mangroves have prop roots descending from the trunk and branches, providing a stable support system. Shallow widespreading roots, surrounds the trunks of black mangroves, adding to the structural stability of the tree. Other species of mangrove trees grow at higher elevations, in drier soils, do not require specialized root structures. Adaptions for salt exclusion or salt excretion allows mangroves to live where other terrestrial plants cannot. 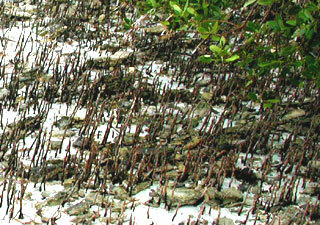 Through physiological adaptations, mangroves are able to live in harsh saline environments. Red mangroves occur where soil salinities range from 60-65 parts per thousand (ppt) while black and white mangroves are found in soils with over 90 ppt salinities. Salinities effectively limit competition from other plants, while mangroves have salt exclusion or salt excretion adaptations allowing survival in these environments. The ability to exclude salts occurs through filtration at the surface of the root. Root membranes prevent salt from entering while allowing the water to pass through. This is effective at removing the majority of salt from seawater. The red mangrove is an example of a salt-excluding species. On the other hand, salt excreters remove salt through glands located on each leaf. Black and white mangroves are both salt excreters. White mangroves develop thickened succulent leaves, discarding salt as the leaves eventually drop. 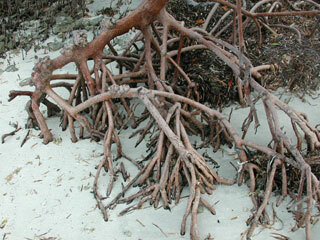 Specialized root structures allow mangroves to live in oxygen-poor sediments. Mangrove trees are adapted for survival in oxygen-poor or anaerobic sediments through specialized root structures. Plants require oxygen for respiration in all living tissues including the underground roots. In soils that are not waterlogged, air diffusion between sediment grains can supply this requirement. However, in waterlogged soils, these spaces fill with water containing lower oxygen levels than air. In contrast to most plants, mangroves have poorly developed, shallow below-ground root systems while having well-developed aerial roots. These aerial roots allow for the transport of atmospheric gases to the underground roots. Red mangroves have prop roots extending from the trunk and adventitious roots from the branches. 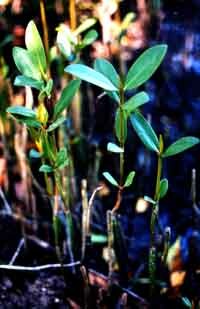 Although the black mangrove does not have prop roots, small air roots can be seen extending vertically from the soils surrounding the trunk. These air roots, called pneumatophores, extend upward from the underground roots above the soil surface. During low tides, air is taken up through open passages in the pneumatophores and transported to living root tissues. Viviparity and dispersal are reproductive adaptations that give mangroves an increased chance for survival. All mangrove trees share two reproductive adaptations – viviparity and propagule dispersal. Similar to terrestrial plants, mangroves reproduce by flowering with pollination occurring via wind and insects. Once pollination occurs, the seeds remain attached to the parent tree. They germinate into propagules before dropping into the waters below. This ability is referred to as “viviparity”. The propagules either take root in the sediments near the parent tree or are dispersed with the tides and currents to other shorelines. pneumatophores: roots on wetland plants that function in respiration. viviparity: bearing or bringing forth live young, as with most mammals. germinate: to sprout or begin to grow.